There is a circular platform or 'terrace' common to each tapestry. It is like a stage where the action takes place. And, it has a green ground covered in flowers and animals. The lady is the principal player, and she is often attended by her lady-in-waiting. The lion and unicorn frame the lady and bear her coat of arms. 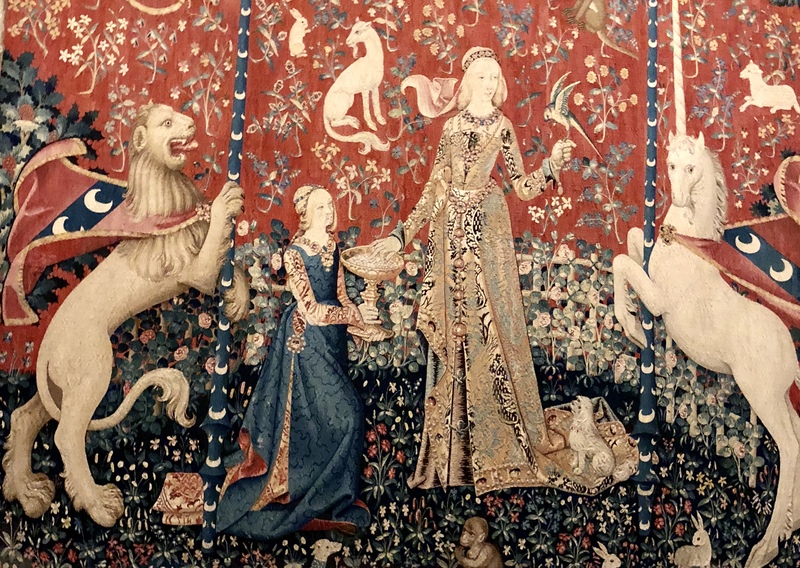 It is is interesting to observe the behaviour of the lion and unicorn in each tapestry. The lady stands alone with her animals in the garden of love. 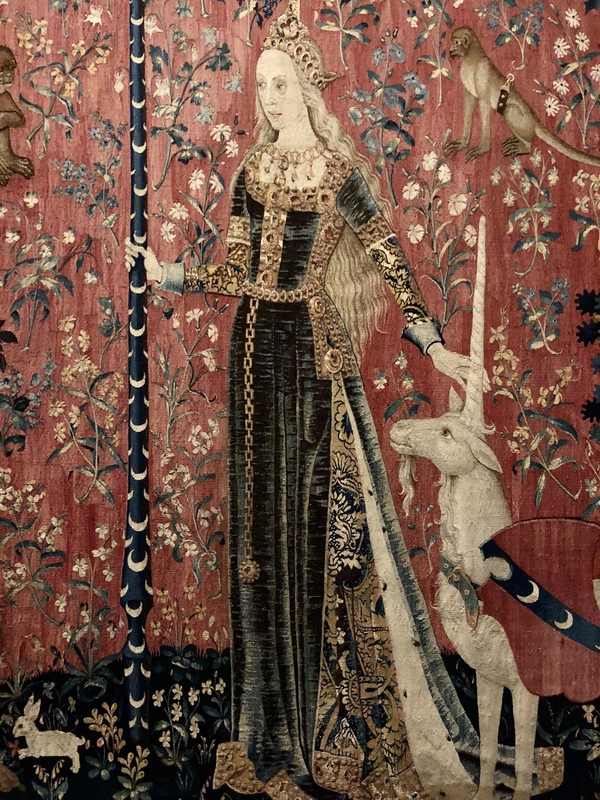 A sense of touch is implied by the way she holds the emblazoned banner with one hand and touches the unicorn's horn with the other. Perhaps she has tamed the unicorn and captured his heart. Collared animals in the background emphasise this idea of capture. 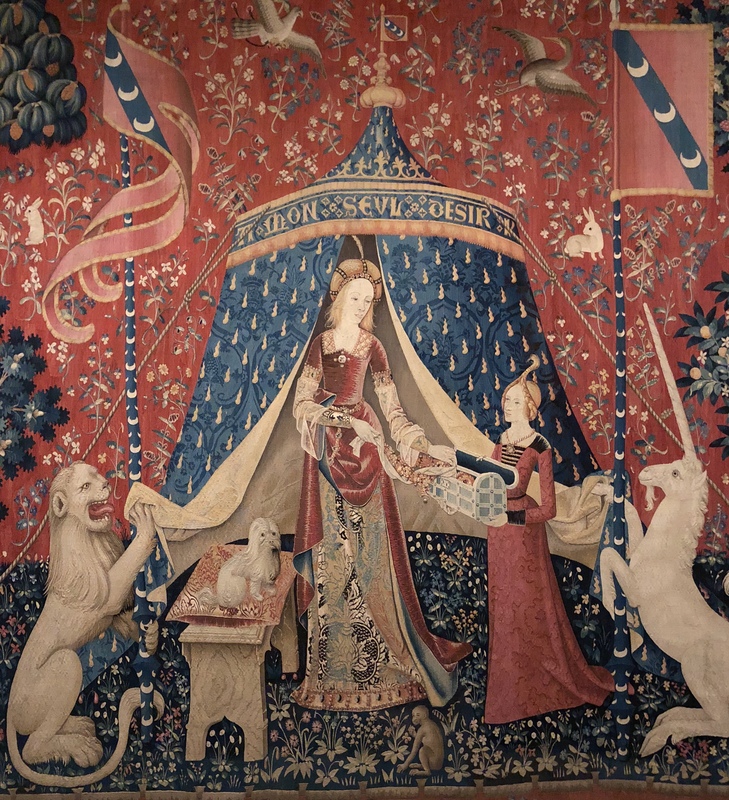 Her free flowing hair held in place by a tiara is a symbolic of virginity in medieval imagery. It would seem that she is a young woman in love. In this scene the lady is attended by her servant who holds a bowl of sweets from which she feeds her pet parrot. The sense of taste is parroted by the monkey also eating a treat. The lady is engaging in the sweet taste of love. Courtly love is symbolised by the rose-covered trellis which encloses the garden. 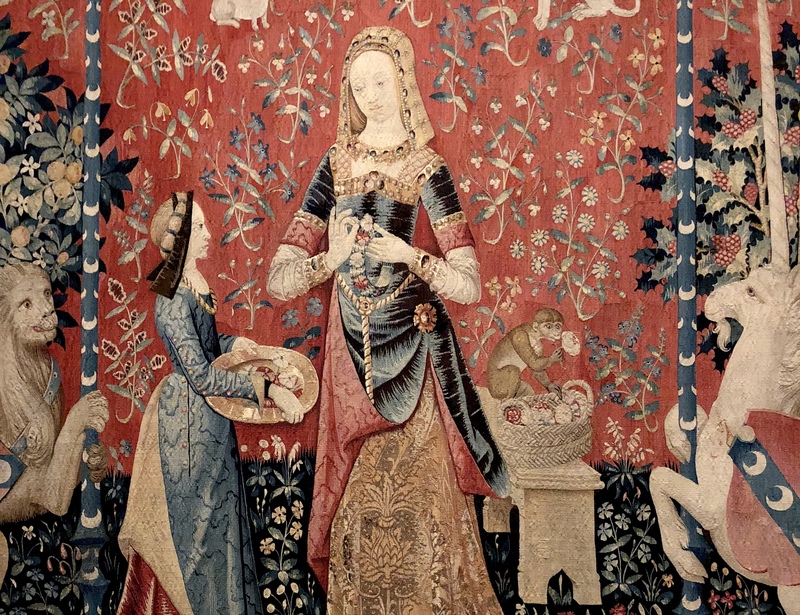 The hunt of the unicorn is also implied by the pomegranates, symbol of fertility, which adorn the lady's belt. The lion is keen to taste the sweets, but the unicorn is clearly interested. The lady and her young companion are playing a small musical instrument known as a positive organ. The lady is magnificently dressed and her hair style is most unusual. She plays the organ standing and her servant works the bellows on the other side. The lion is looking quite vexed by the sound, but the unicorn quivers with pleasure. The lady's musical accomplishment is a noble attribute in an era of courtly manners and a sign of personal refinement. And she has clearly captured the unicorn's heart. 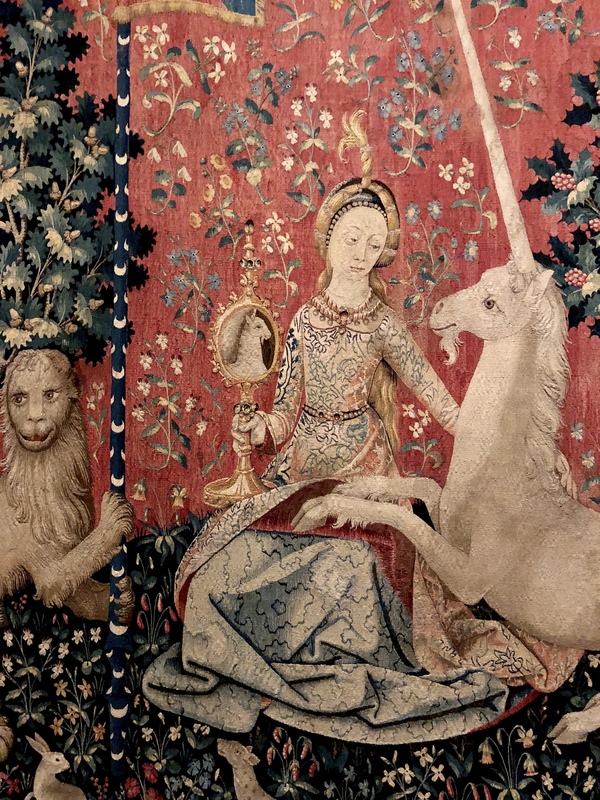 This is an intimate scene focusing on the gazes between the lady and the unicorn. The lady is holding a beautiful golden mirror reflecting the unicorn's intimate expression. According to myth the fierce and swift unicorn can only be captured if tamed by a virgin. The unicorn abandons his heraldic function to gaze at his own reflection. The unicorn in turn gracefully lays his forelegs in the lady's lap. The lady has clearly captured the unicorn and his heart. The lion looks away into the distance taking the role of the standard bearer. This scene is believed to illustrate the sixth sense. In medieval times, this was the soul, the mind or the heart giving rise to a moral life. On the other hand is was the seat of carnal desire. 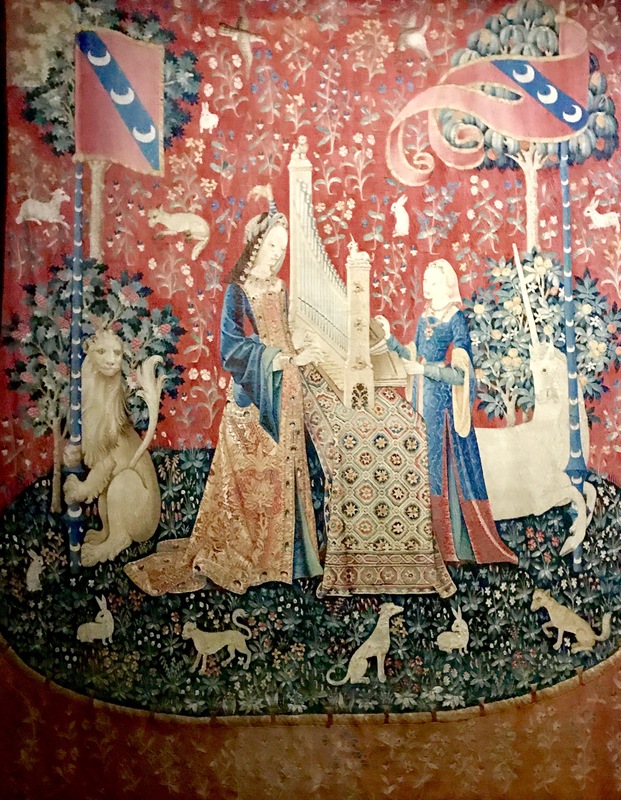 This dichotomy is shown in the tapestry where the lady can be either taking jewels from the casket to wear before entering the tent. Or perhaps she is returning them in a gesture of renunciation. Maybe she is rejecting the pleasures of the senses, by her own free will, or her 'sole desire'. However, there are two letters 'A' and 'I' at each end of the inscription, which may be the initials of the two fiancés. So the inscriptions seems to refer to the two meanings of the heart, as the sixth sense. David Hockney has been true to his words! And, to celebrate his 80th birthday, a lifetime span of his works is exhibited (June 21 to Oct 23 2017) at the Centre Pompidou, Paris. This huge collection of his works gives amazing insight into the development of his work. As well as the major influences leading to the following turning points in his work. During this time Hockney trained at Bradford School of Art. His paintings were typical of Realism representing the daily life of the working class. Builders, painted in 1954 is a good example. At the Royal College of Art (RCA) in London, Hockney was influenced by American Abstract Expressionism. This led to a series of clever and humorous works dealing with homosexuality. Cleaning Teeth, Early Evening, 1962 is an amusing example. In this period Hockney experimented with heaps of different painting styles from Pop Art to Renaissance to Egyptian. I particularly like his Flight into Italy - Swiss Landscapes, 1962 with the Alps standing tall and solid contrasting with the speeding Futuristic style flying vehicle. Hockney moved to California and embraced its hedonistic lifestyle. He became famous for his swimming pool series, especially Portrait of an Artist (Pool with Two Figures), 1972. Photography also became a constant source of inspiration and experimentation for Hockney. This time period was marked by Hockney's large 'Double Portraits', paintings of his friends. The interactions between these couples is very awkward and they become like psychological studies. Mr and Mrs Clark and Percy, 1970-1971 from the Tate Gallery is one of the most famous. Many features in the painting point towards the couple's independence, especially the way they are looking towards the spectator and not at each other. Celia Clark became one of Hockney's favourite subjects to draw. Drawing his friends has been a life long practice for Hockney. During this time, Hockney invented clever ways to confront Greenberg's Formalism. In Savings and Loan Building, 1967, there is a perfectly formalist, geometric Minimalist building, but three palm trees are defiantly painted in the foreground. My favourite painting from this time is Rubber Ring floating in a Swimming Pool, 1971. The red ring floating near the edge of the pool, painted from a photograph, looks very abstract. But, the clever twist of the title confronts the abstraction. At this time Hockney designed sets and costumes for the opera. This led him to question classical perspective and to experiment with spatial constructions. Especially interesting is his research into Hogarth's use of perspective, while he was making sets for The Rake's Progress. Next Hockney began his experimentation with colouring and making paper pulp squares which became gridded swimming pool scenes. He achieved a remarkably shimmering water surface, like in A Large Diver, 1978. Influenced by Picasso, Matisse, Dufy, Marquet, Mondrian and Kandinsky, Hockney next experimented with loose, colourful images that explored new perspectives. Nichols Canyon, 1980 has a strong Fauvist influence. During this time Hockney took the idea of the 'grid' to extremes with his multifocal Polaroid images. He sometimes used over a hundred photographs to create a portrait like Kasmin, Los Angeles, 28th March, 1982 or Pearblossom Hwy, 11-18th April, 1986. Some Very New Paintings came next. Here, Hockney seems to bring together all of his past experiments. The paintings are filled with luminous colour, and complex abstract compositions which are abstract, but allow the viewer space to move around in these 'inner landscapes', like in The Twenty-Sixth V.N. Painting, 1992. Hockney began to spend more time in his native Yorkshire in 1997 to be close to his friend Jonathan Silver. Driving through Yorkshire to see his friend, he began to see the beauty in the Yorkshire landscape. And so began the remarkable landscapes that he is still creating today. 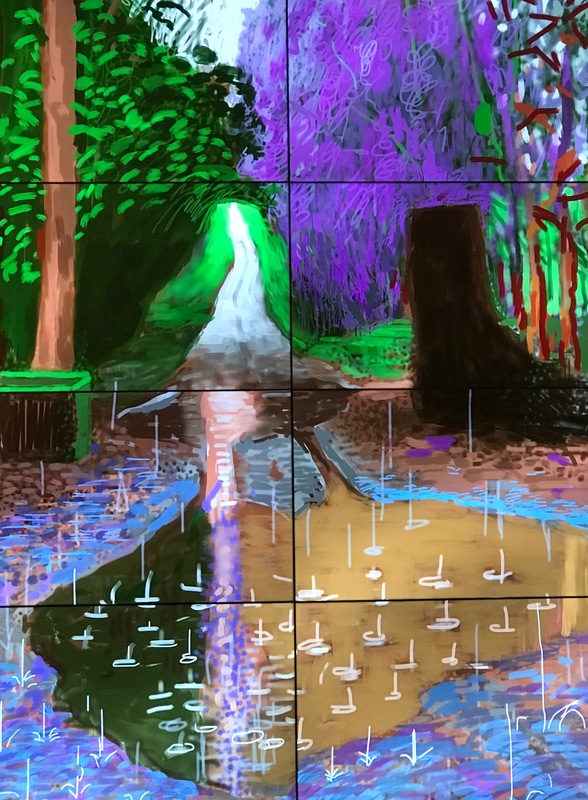 Hockney took his Yorkshire landscapes a step further by creating large gridded images. He paints these en plein air with each individual canvas a size that is easy to transport and put on an easel. In 2008 Hockney began to work on a computer again. Then, in 2009 he made his first iPhone drawings. And when iPads became available in 2010, he fully embraced the drawing medium. There was a extensive range of these drawing on display at NGV in early 2017. His experimental photography of the changing seasons in Woldgate were also on display. This exhibition ended with some of his brilliantly coloured oil paintings of his garden in Santa Monica painted in 2016! The exhibition is currently at the Metropolitan Museum of Art, New York. His highly innovative work is at the cutting edge of technology and aims to inspire new ways of seeing. In fact, his work is so inspirational I couldn't wait to download the 'brushes' app, buy a stylus and start doing i-pad and i-phone drawings. Some of my efforts can be seen on instagram. Many of Hockney's landscapes deal with nature and he paints enormous trees like the one above. But he is also fascinated by pathways that lead the viewer into the landscape on an imaginary journey. This is also a theme that I am currently exploring to show the pathways leading through the Via Francigena pilgrimage route from Canterbury to Rome. I have chosen to talk about the works that inspired me the most. 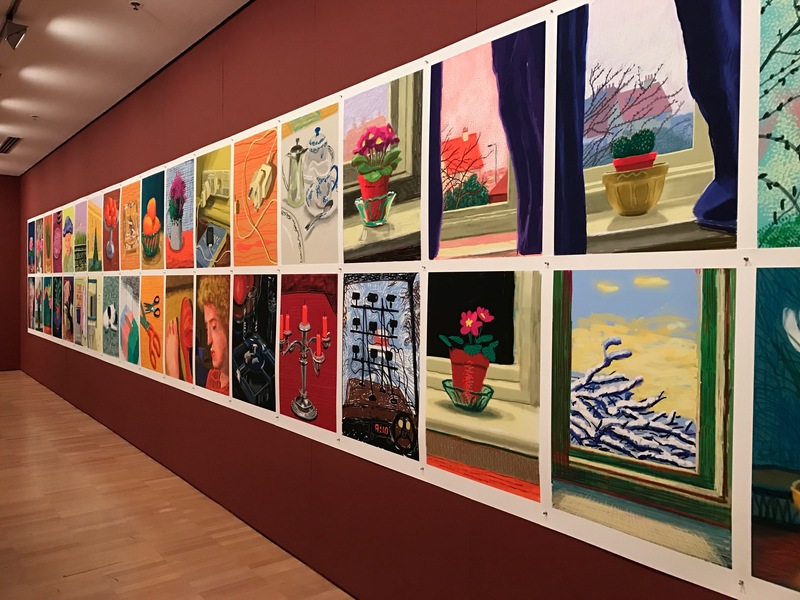 But, in the exhibition there are other truly remarkable works, especially Hockney's innovative use of video cameras to record the seasons. He also uses video to capture the interplay between time and space. Orvieto Duomo is an Umbrian highlight!